Muhdo Health Ltd is a DNA profiling company founded in 2016 in Ipswich, Suffolk. It was built around the idea of mass personalization of curative and preventive healthcare through epigenetics. In other words, its testing solutions allow you to determine the influence of regular life circumstances (stress, exercise, diet, smoking…) on the overall behavior of your genes. 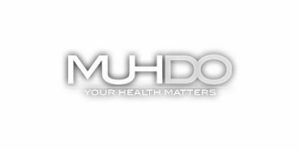 Keep reading this comprehensive Muhdo review to learn all about the company’s testing solutions and how silencing or expressing certain genes affects your health and fitness and influences illness and disease prevention. Placing an order – When you identify the best testing solution for your needs and personal goals, you can place your order on the official website. In order to complete your purchase, you have to provide your first/last name, country, street address, town/city, zip code, phone number, and email address. The company accepts PayPal as well as all major credit cards. If you cannot afford to cover the price of the test all at once, Muhdo also provides its users with budget-friendly installment plans. Collecting the sample – After the company receives your order, your personal DNA testing kit will be shipped to the provided address. The kit uses cotton swabs to collect buccal cells from the inner sides of your cheeks. Note that you should not smoke, eat or drink anything but water for at least 30 minutes (ideally 2 hours) before swabbing. Make sure to fill out your unique personal ID sticker (date of birth and gender) and place it on the sample tube. Sending the sample back – Once your DNA sample is secured within the tube, you should place it inside the provided prepaid envelope and simply mail it back to the lab for further processing. Inspecting your results – Once the lab techs extract and process your DNA sample, you will receive an email notification (with a link to your account) telling you that your personal report has been generated. The average turnaround time for this test is between 4 and 6 weeks. 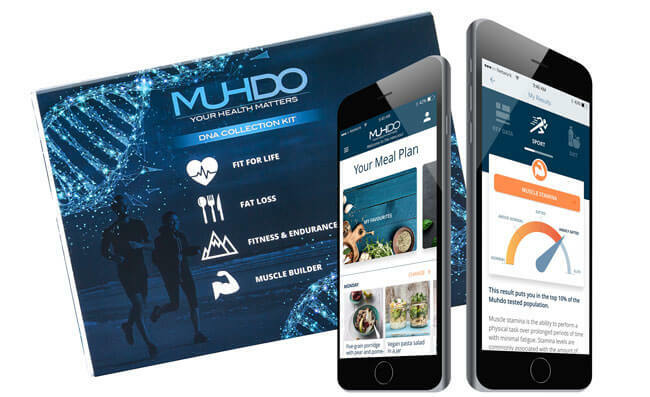 Every report delivered by Muhdo is fully personalized and includes recommendations on everything from diet and training to micronutrients and supplementation. 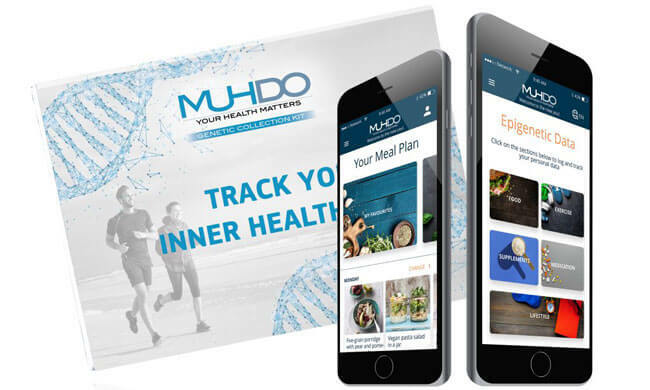 Muhdo DNA profiling test analyzes 78 genetic markers and screens for 181 genetic variants, which helps you achieve your health and fitness goals more efficiently and sustainably. Fit For Life – This mode revolves around nutritional and health recommendations for people who just want to stay fit and healthy without actually going to the gym. Fat Loss – The Fat Loss mode provides you with a wide variety of recommendations (health, nutrition, and fitness) in accordance with your unique genetic profile. Fitness & Endurance – This mode will help you build speed and endurance by giving you a wide variety of personalized recommendations aimed at increasing your overall performance. Muscle Building – This option will help you get leaner, improve strength, and build muscle. It offers recommendations on workout adjustments as well as micro/macro changes that will align your workouts with your genetic profile. Your final report will contain free meal and workout planners with personalized diet and exercise regimens designed to correspond to your personal goals, eating preferences, and unique genetic profile. Apart from this, you can also unlock new health aspects each month, including anti-aging, addiction, injury prevention, sleep management, heart health, skin health, gut health, stress management, mental health, and eye health. This option provides you with everything included in the previous test and adds crucial information about your biological age, tracks your internal health (inflammation, stress, and hypertension) twice a year, and informs you about the effects of pollution on your health. Muhdo takes all the necessary precautions and implements numerous measures to store your personally identifiable information as securely as possible. The company will never share your data with any third parties without your explicit consent unless required to do so by law. 5 years – Name, address, email, phone number, gender, height, weight, date of birth, and payment information. 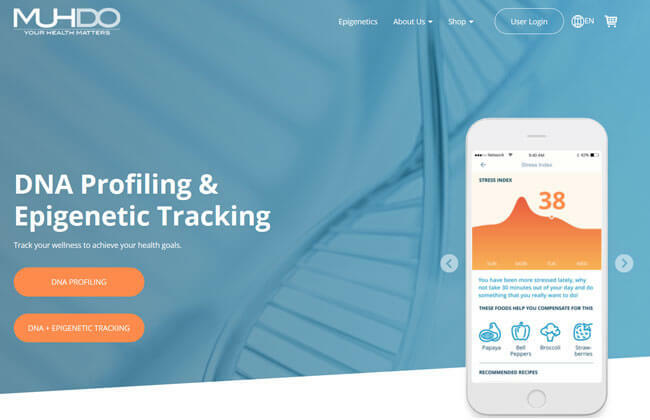 Anonymized, encrypted, and used for research purposes – Your DNA and epigenetic profile, lifestyle and demographic data, medical information, and more. Muhdo does not provide a lot of information regarding its official shipping & handling policy. The personal testing kits are prepped and shipped within 24 hours of receiving an order and the average time of arrival depends on your location. However, we cannot say whether or not the company ships internationally. Its official shop page, which also holds the FAQ section, does not appear to be functional anymore and we did not receive any response from the support team while writing this Muhdo review. Muhdo can improve your overall health and fitness by allowing you to work with your unique genetic makeup instead of against it. You will receive your DNA analysis with all the results packed into your personal dashboard. Based on your report, the company will generate personalized diet and exercise plans and also determine how everyday pollution and other important factors influence your genes and personal goals. Apart from providing its users with high-quality service, Muhdo also allows them to opt for some of the available installment plans in case they cannot afford to pay the whole sum right away. 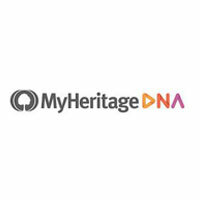 This makes it one of the rare DNA profiling companies to implement such a feature. Bottom line, Muhdo is a niche company with a decent money-to-value ratio and great commitment to helping its users become the best versions of themselves. Our ratings are the result of an objective and independent evaluation of Muhdo, generating the final rating that reflects the overall quality of the company. Ratings may change as the service changes. Muhdo user rating based on 2 user reviews. The modes are such a good addition to already pretty great service. While I was losing weight, I used the fat loss mode and it gave me all the meals I had to eat throughout the day, exercises I had to do and a bunch of other useful stuff. In other words, I didn’t have to think about anything except eating healthy and working out. Now that I’m in decent shape (finally!!! ), I switched to the muscle building mode and keep following all the recommendations to the letter. Great stuff, def worth the money. Muhdo is pretty mediocre I would say. It’s not a bad service, it’s just similar to millions of other companies that do the same thing and give you the same results over and over again. We found 0 verified Muhdo discounts for April, 2019. There are no Muhdo coupons or discounts right now.